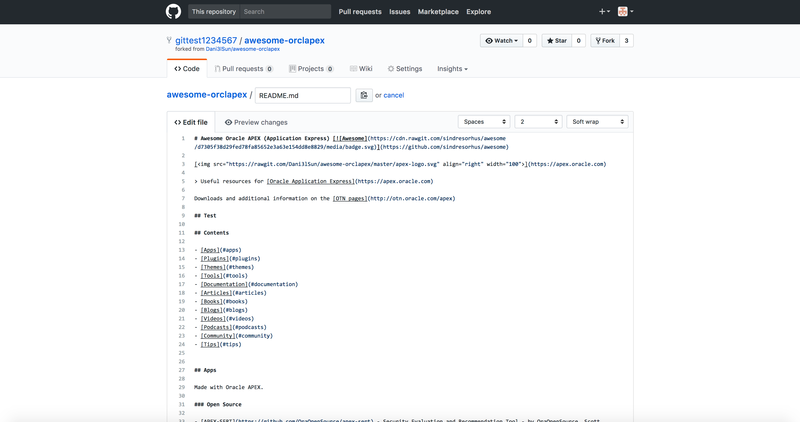 You are now able to simply add an APEX badge to your APEX GitHub projects. This is done by nothing more than adding some markdown to your Readme.md file or any other markdown file in your repository. You will find more badges and examples on the GitHub project page. Contributions and ideas, maybe new badges are highly welcome! 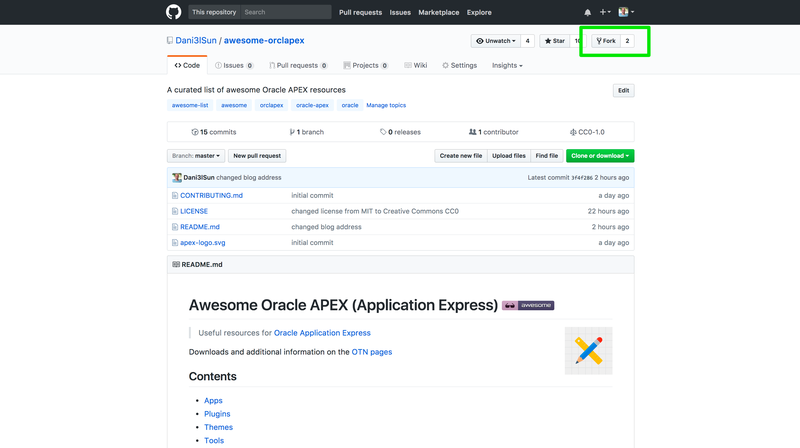 because #orclapex needs its own @github #opensource awesome page for useful resources: https://t.co/esXMSFkSmd feel free to contribute! So I´m calling now for community power to help extending that list with great articles, blogs, tips & resources. Goal should be to make this awesome list even more awesome and a helpful guide / reference for everyone using Oracle APEX! 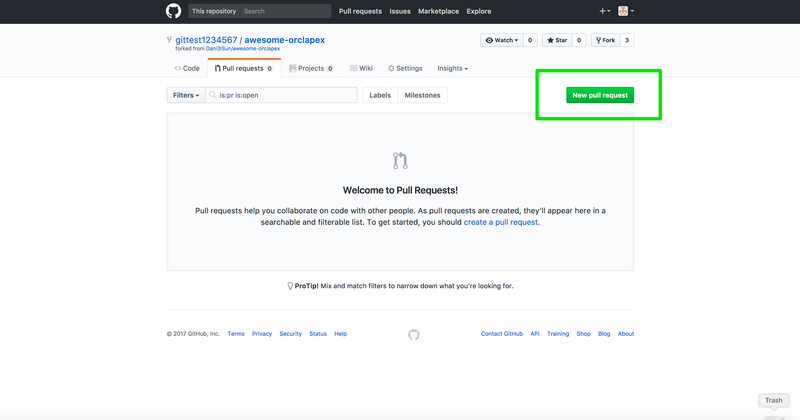 Create a Pull Request to pull your changes to the main repository. I will review the changes and merge it into the main Readme file. 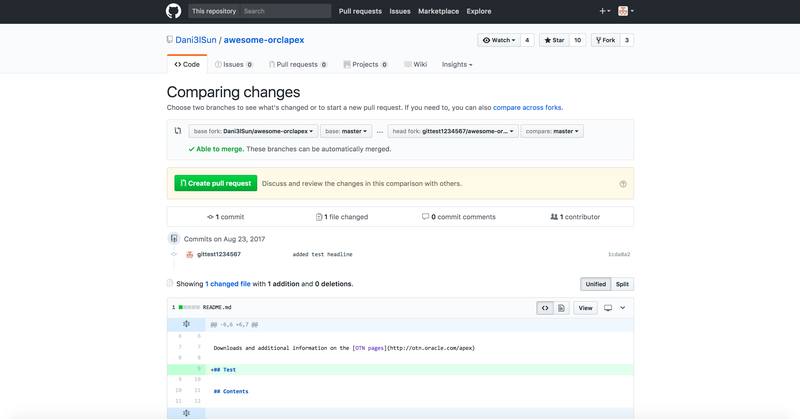 Ps: Maybe you´re interested in the complete GitHub awesome stuff, then you will find many awesome projects here. As I really like Docker and use it pretty much in my daily life as a developer, it became a inherent part in my workflow. I use it for my development instances or for having test servers pretty fast available. 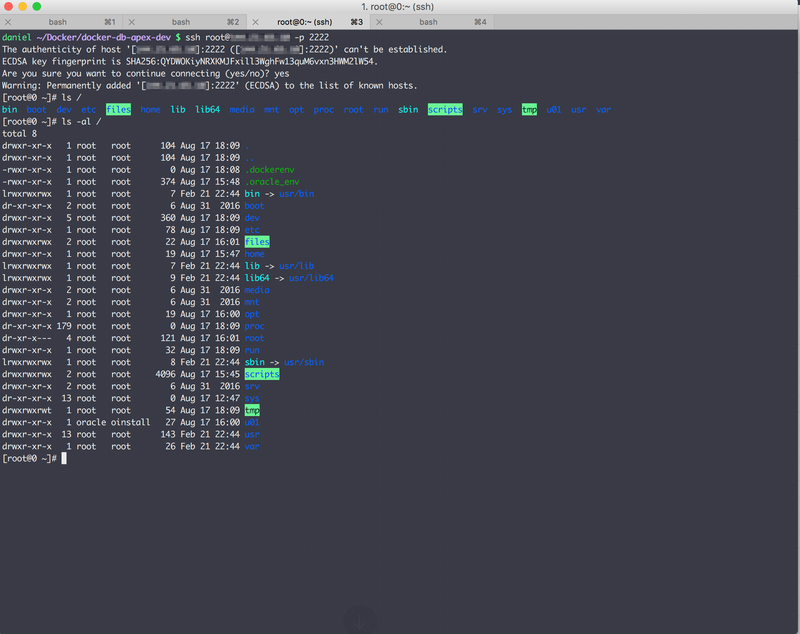 Even sharing the images with other devs or have some demo environment within minutes, Docker sets the bar pretty high. 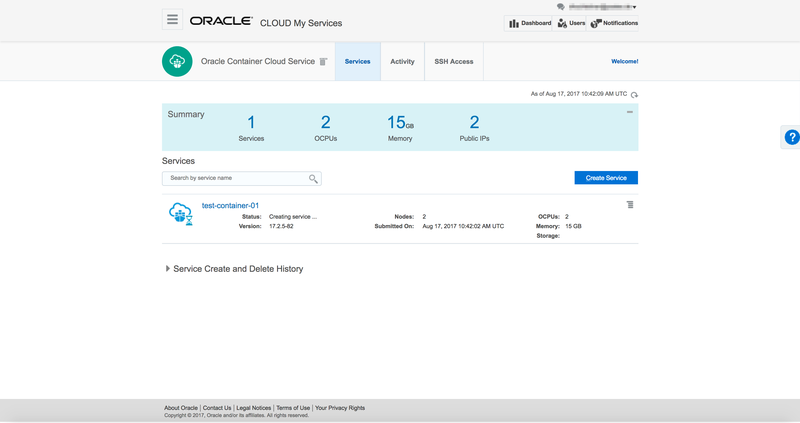 So in the past I only used Docker on my local machines or servers but I was interested if my image works in the Oracle Cloud too. So I decided to give it a try, and lets have a look what Oracle have in petto. 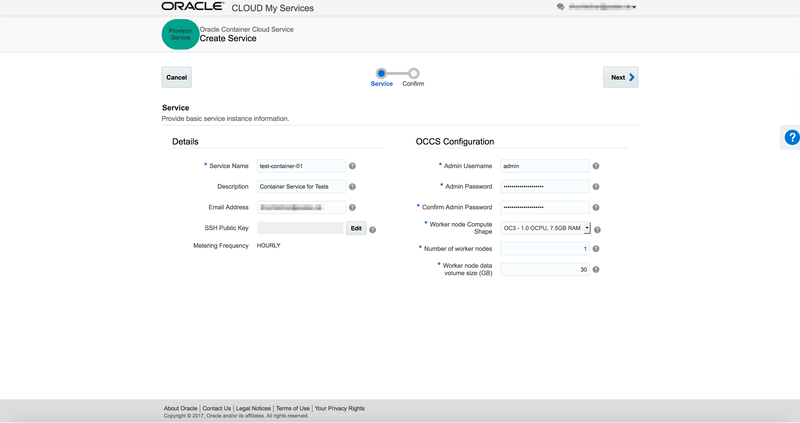 After my registration was successful, Oracle had my cloud account ready within 4 hours. (Which is OK, but of course it could be a bit faster if you have a look at other big cloud companies…). In the welcome mail, I got all the information I needed to get into the Oracle Cloud. 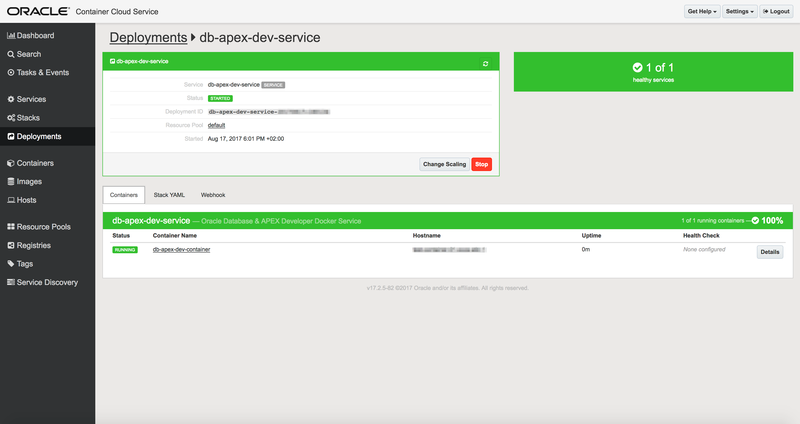 Main focus is to get our own built Docker image running in the Oracle Container Cloud Service so we can use it and can connect to the services like APEX, Database or SSH. This was really easy to accomplish, after login I navigated to the Container Service Section and created a new Service. 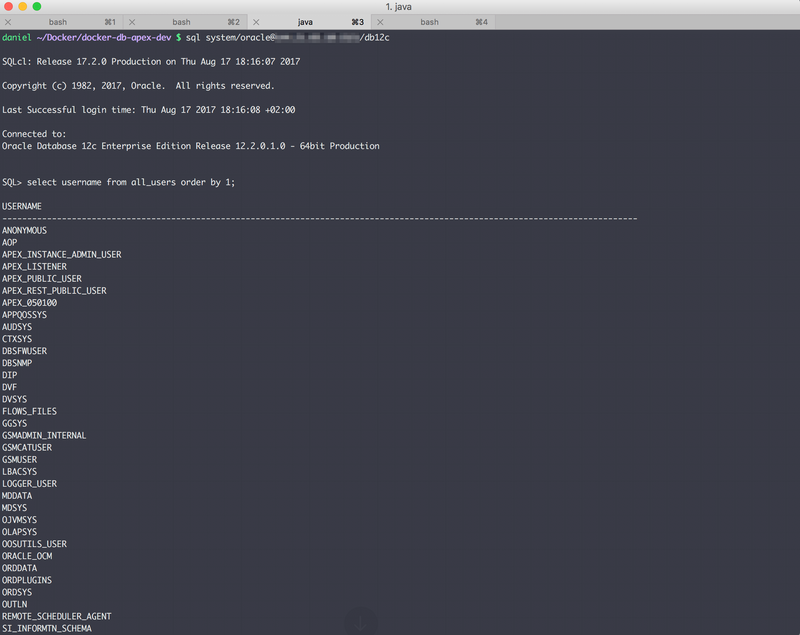 The following screen shots will show the different steps and the create wizard. 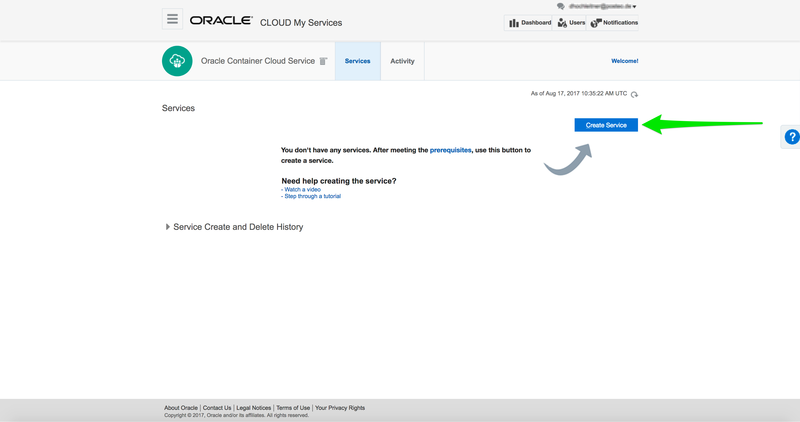 About 30 minutes later I received an mail from Oracle, that my newly created Container Service is now up and running. 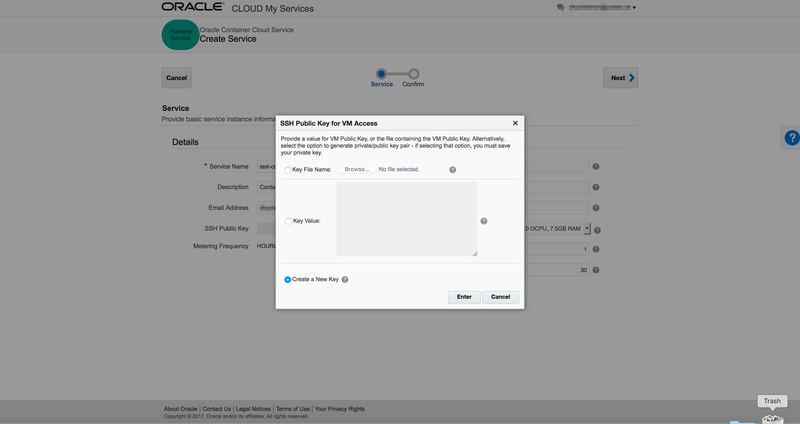 Having this information we can login to our Oracle Container Cloud Service entering https + Public IP into our browser. 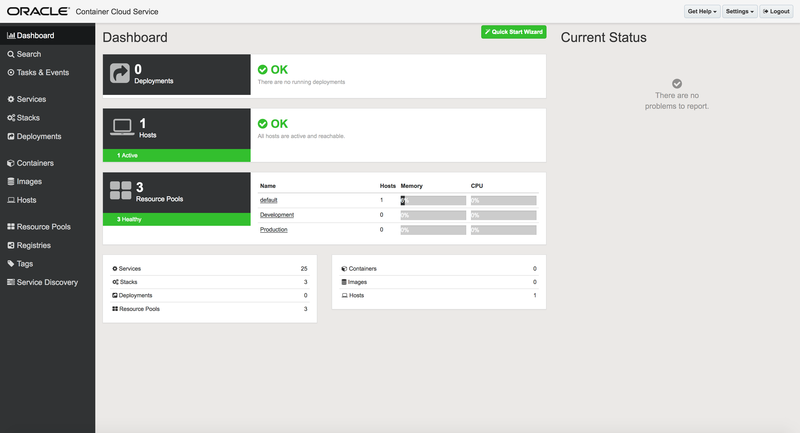 After we have successfully authenticated we will land on a dashboard page of the service. 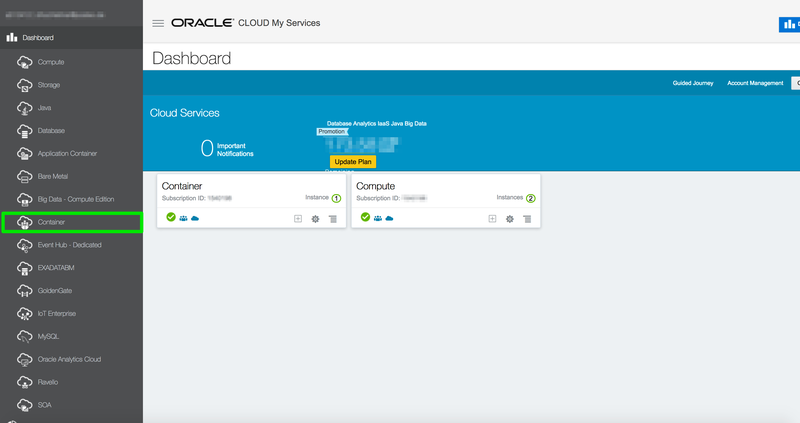 For now we are finished within the Oracle Cloud web interface, we successfully got an cloud account, created a Container Service and logged into that service. This procedure was indeed straight forward and not that complicated. It took me about 5-10 minutes to get this done. Really nice! 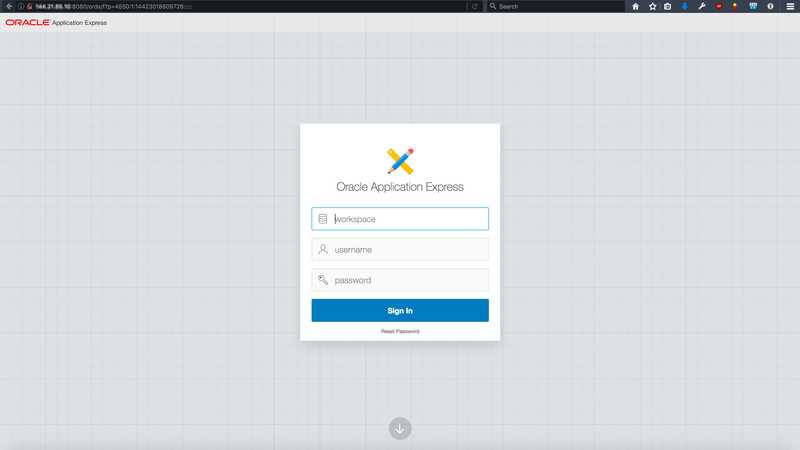 Next is preparing our Docker image so we can use it in the Oracle Container Cloud Service. 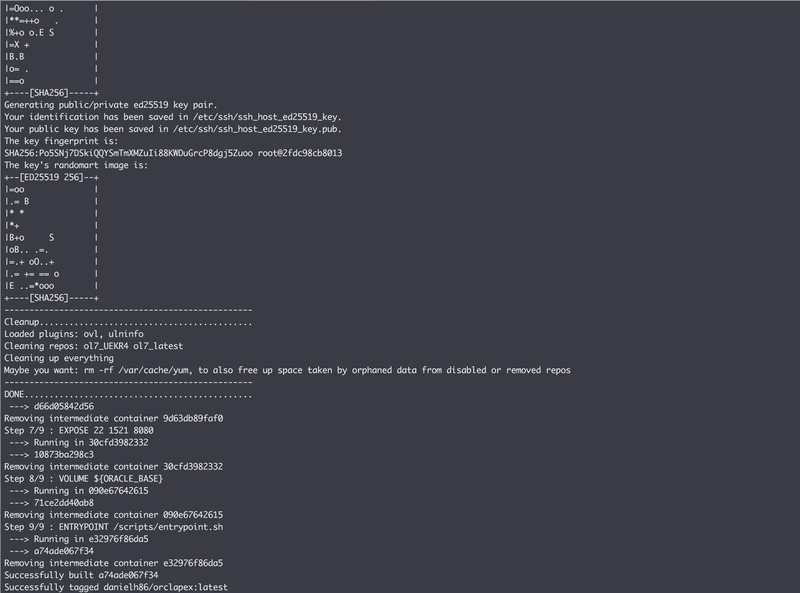 docker build -t db-apex-dev-image . 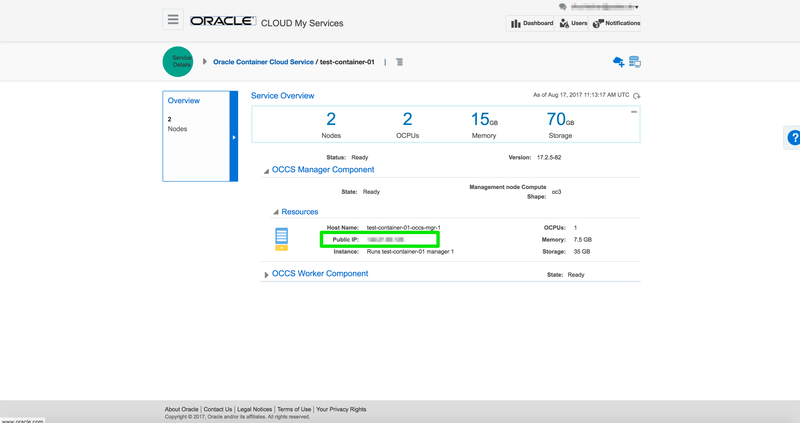 Thus it is needed that the image is uploaded to some location our Oracle Container Cloud Service has access to, I used Docker Hub to get this done. But of course you can use every other or maybe your own Docker registry server. 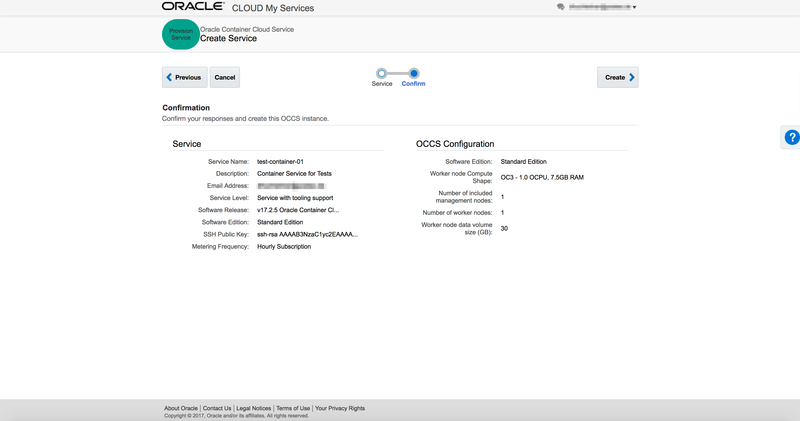 Important is that the Oracle Cloud server can access your registry server. 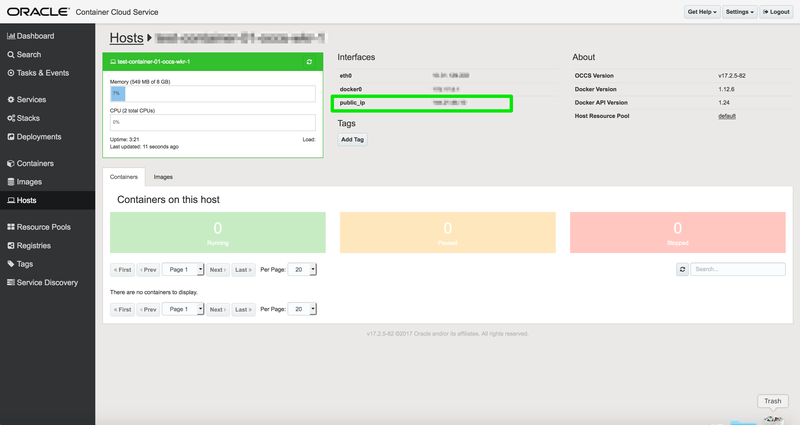 The benefit of using Docker Hub is that we only have to create an account there and the Oracle Container Cloud Service has per default access to that registry server, which means we don´t have to configure anything. Entering username and password of the Docker Hub account and we are done. 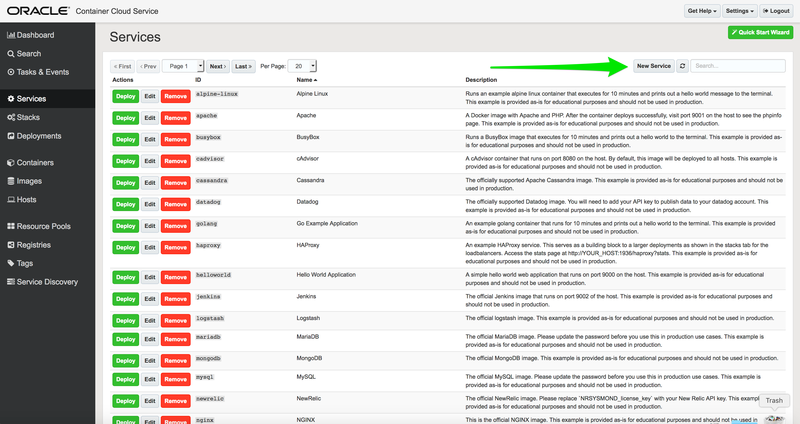 Note: Make sure that this image is publicly available, this can be configured in the Docker Hub web interface. 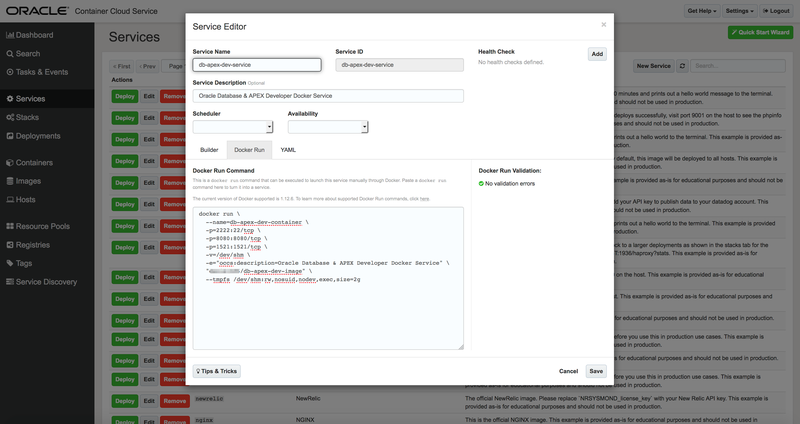 If you want to have it private than you have to configure your Docker credentials in the Oracle Container Cloud Service admin panel. After we have done that, all the necessary input fields of the create window are automatically filled. 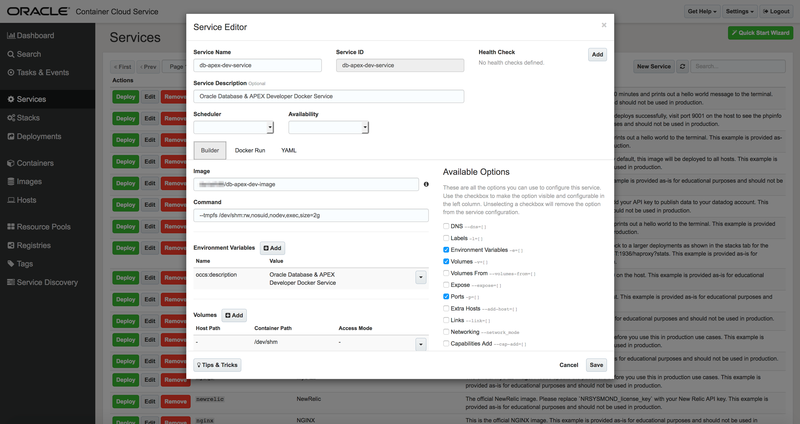 Only the service name input have to be set by hand. Here are some screen shots which describe the procedure. Finally we have our Container Service defined and now we will see it up and running. The only thing we have to do now is to press the green Deploy button. 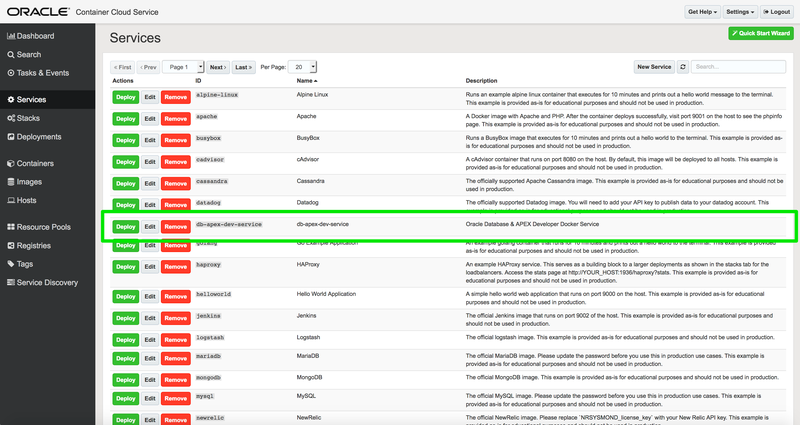 Now Oracle fetches our Docker image from Docker Hub and runs it with our configured run parameters. This step takes a few minutes to complete. To get the public address of our running services we have to go to the hosts detail page, this IP address is used for all containers/services running in this particular Container Cloud Service. This means all network ports which are defined, can only be applied once. Note: These are the default port mappings as we defined in the docker run section above. The users and passwords are defined before building the docker image, read more about it on GitHub.